I’m pretty much convinced Rep. Ilhan Omar could do anything and the Democrats would uncritically get behind her. Omar hasn’t done anything criminal, mind you, but let’s remember that this is the individual who, just a few weeks ago, made anti-Semitic remarks implying Jewish Americans might have a dual loyalty to Israel. Then, a resolution to condemn her anti-Semitism became a meaningless piece of drivel that condemned all sorts of hatred. This, mind you, was just a few weeks ago. Last week, footage of Omar reducing the 9/11 attacks to “some people did something” during a speech before the Council on American-Islamic Relations went viral, particularly because of a video released on President Donald Trump’s Twitter account that interspersed what she said with footage of the attacks. 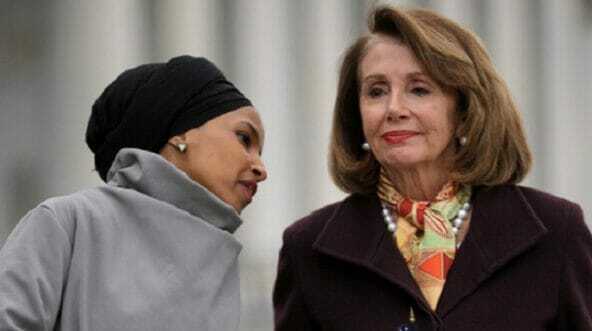 As with most Democrats, House Speaker Nancy Pelosi naturally turned her criticism to Trump for criticizing Omar’s remarks, not toward Omar for actually making them. “The memory of 9/11 is sacred ground, and any discussion of it must be done with reverence. The President shouldn’t use the painful images of 9/11 for a political attack,” the speaker said in a statement, according to The Hill. That whole line about Omar’s safety has become the go-to for Democrats. Omar herself tweeted out a statement that alleged death threats against her had increased since the footage of her 9/11 comments was released. “We are all Americans. This is endangering lives. It has to stop,” Omar wrote. Now, Pelosi is demanding that it stop, commanding the president to take his tweet down. “. @realDonaldTrump’s dangerous video must be taken down,” Pelosi wrote in a Sunday tweet. “The President’s words weigh a ton, and his hateful and inflammatory rhetoric creates real danger,” the statement concluded. Look: Death threats are horrible. They’re illegal, and if you make them, you should be spending a decent chunk of your life behind bars. That doesn’t erase the fact that Rep. Omar said something reprehensible. Her claims that threats have increased because of Trump’s criticism is merely an argument for additional security, not the cessation of criticism. Nobody incited violence here. Nobody wants violence. Nobody wants a politician attacked because of her faith. What critics of Omar want is either an acknowledgment from an elected official that she crossed a line or the ability for everyone else to point that she had crossed a line. Is this what Democrats are really going to do every time Ilhan Omar says something cretinous? Hide behind concerns for her safety? Because, let’s face it — something like this will happen again. We’ve been through this how many times already? The president’s video was criticism. It was harsh criticism, yes — perhaps even harsher than you might have liked. It wasn’t an incitement to violence, either directly or indirectly. For Democrats to use that claim as a shield — and demand the video be taken down — is an act of political cowardice.